The stoneware “carriers” and porcelain “tablets” are objects representing an ongoing dialogue I have had with a few simple ideas revolving around order/symmetry, containment/community, and history/weight. As society puts an increased premium on speed and efficiency, I feel more compelled to offer a slow and sometimes awkward experience, both in the reading and real use of a pot. Perhaps this is a common and dated response for anyone involved with the production of a handmade object and the inherent inefficiencies involved with the various processes (at least mine). Because of the gravitational pull toward “fast”, I find myself drawn to making the “slow’ object.” This thinking is not rooted in a disinterest or distrust of technology, rather it is a straightforward way for me to extend a conversation with a user/viewer, potentially providing a platform for a meaningful encounter. 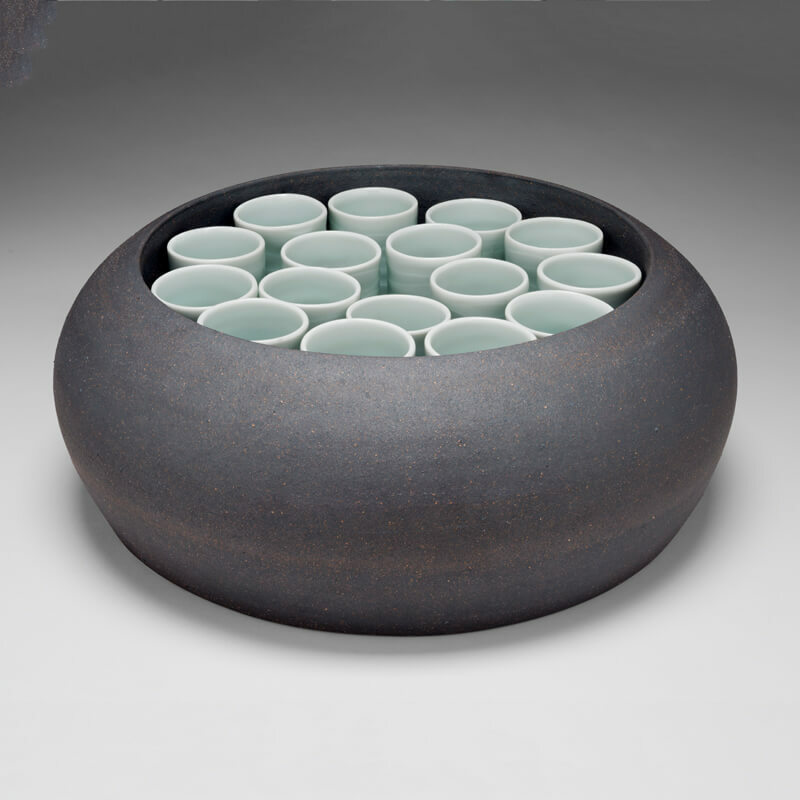 For several years now I have been involved with a relatively simple object reflecting a simple idea: that is, to make a container that allows for the transport of several cups (or sometimes bowls or cordials). To “carry” is my effort to construct an experience that brings a pot close to one’s center, while encouraging an awareness of weight, proportion, and scale. The number of cups implies community; the act of carrying is a gesture of giving. It is my desire that the awkwardness of lifting a cup as it “scrapes” a wall will provide a subtle catalyst for seeing and feeling a new relationship with something as familiar and ordinary as a cup, as well as to serve as a bond for those gathered. The absence of cups intimates presence, and I enjoy that inferred reference.